The deck of cards was probably introduced to England in the late 14th century, immediately rivalling the popularity of old games of chance like dice. Whilst playing cards were absolutely nothing new – the ancient Egyptians used to play them – the standardised ‘suits’ of hearts, diamonds, spades and clubs that we’d recognise today was adopted from a newly evolved French style; previously, people would have played with suits more resembling old tarot cards – coins, wands, swords, cups etc. However, the stylised French ‘Queens’ on our modern cards bear more than just a passing resemblance to one of our own queens – often overlooked now but beloved by her contemporaries – Elizabeth of York, wife of Henry VII, mother of Henry VIII. The moment you juxtapose Elizabeth’s most famous portrait with the image of a modern card deck Queen you can see the similarity, what with both queens’ pointed gable hoods with long, hanging lappets to the side, each daintily holding a flower. In particular the face of the Queen of Hearts bears a strong likeness to the regular and fair features of Elizabeth’s standard portrait. 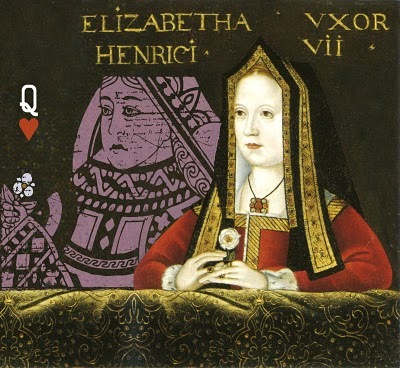 The story goes that Elizabeth of York was so fond of card games that – after her early death on her 37th birthday, after childbirth – the grief-stricken Henry VII ordered that her image become that of the Queen of Hearts, so that in this way she could continue in the pastime she had loved forevermore. Elizabeth was certainly fond of a flutter – much like the rest of her court; her accounts are full of gambling debts being paid in and out. And Henry VII was grief-stricken by her early death, “privily depart[ing] to a solitary place, and then would no man should resort unto him”. But that, sadly, is probably as far as the truth of this legend goes. Whilst Elizabeth of York as Queen of Hearts is the only personage-as-card we recognise, the French – whose styling we nicked – had identities for all of their ‘face’ cards. Their Queen of Hearts was Judith, a biblical character, whilst the King of Hearts was the famous Charlemagne. So, rather disappointingly, today’s Queen of Hearts is probably just a pastiche of a mythohistorical Jewish woman wearing the glad-rags of a late 15th century queen – the point at which the pastime started to become popular – rather than a touching and enduring tribute to an increasingly marginalised Queen Consort. This entry was posted in blog, history and tagged 15th century, Elizabeth of York, Erin Lawless' blog, Henry VII, Plantagenet, Playing cards, Queen of Hearts, Tudor. Bookmark the permalink.